One story dominates the cruise news this month and that is the naming by Her Majesty of Cunard’s new flagship Queen Elizabeth at its traditional home port of Southampton. For the first time in its 175-year history Cunard (now owned by the US cruise giant Carnival) will have three ships named after Queens of England in it fleet, Elizabeth, sister ship Victoria, and Mary, which the company prefer to have the number 2 after the name. One thing has emerged over the last week. Plans for her to show off against HMS Queen Elizabeth in perhaps 2016 can still be kept alive. The aircraft carrier was saved in the defence cuts. The original Queen Elizabeth (83,000 tons) entered military service in 1940 and was finally decommissioned in 1969. Her much loved successor, QE2, also built on the Clyde, was actually smaller at 70,000 tons. Likewise a true Atlantic liner, but not as fast (Concorde launched at much the same time was somewhat quicker – by the 1970s there was no transatlantic race) she saw nearly 40 years of service finally bowing out in 2008. Cunard could have been tempted to make Queen Elizabeth even larger than Queen Mary 2 (150,000 tons) but marketing and commercial considerations held and the new Queen is a sister ship to Queen Victoria (92,000 tons), not a liner in the true sense but a dedicated cruise ship, in many ways the culmination of a shipbuilding boom over the last ten years, a craft built for quality and allure, far from the gaudy design which some competitors see as the way forward. 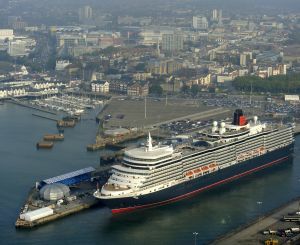 Today (25 October) Queen Elizabeth leaves Southampton for a 14-night Mediterranean cruise. On 14 December she goes transatlantic for the first time to spend the Christmas period in the Caribbean, but New Year’s Eve will be spent at sea on the way back to the Azores and Southampton once again. 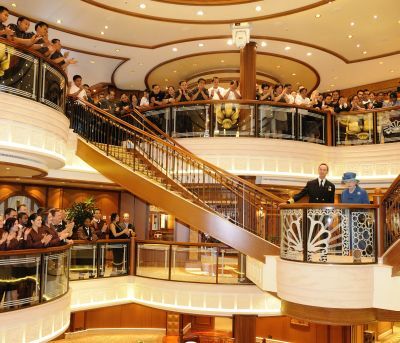 In what is a brilliant piece of publicity Queen Elizabeth then sets out on a 103-night Round the World Cruise, showing the flag and being made very welcome at what will be in every case a maiden port visit. She’s a very tight fit through the Panama Canal, but the Suez version will be easy. AdventureSmith Explorations, a specialist operation that matches adventure seeking clients and a treasure trove of small, expedition ships, has published its 2011 adventure portfolio. Packages include water-filled worlds from Patagonia to Alaska and points between on adventure-laden itineraries for small ship cruise aficionados. Todd Smith, AdventureSmith Exploration’s (www.adventuresmithexplorations.com) owner and founder, said that demand is high for new ships and new destinations. Hapag-Lloyd has come together with technology innovator Siemens to provide a truly world wide cruising mobile phone service. Passengers aboard MS Europa make and receive mobile phone calls just like they do ashore. This is possibly thanks to a technological solution by Siemens AG called “MOGIS” (Mobile GSM Infrastructure over Satellite). MOGIS connects the cruise ship with a satellite which ensures that mobile phone calls can be conducted at all times worldwide. The mobile phone technology is operated by OnAir who are supplying a similar system to airlines. MSC Cruises is to venture into the Gulf area later next year and in 2012. Departing every Sunday from Dubai and every Friday from Abu Dhabi, the 2,069-passenger MSC Lirica will offer weekly seven-night sailings. Ports of calls will include Muscat (Sultanate of Oman), Al Fujairah (UAE), the island Kingdom of Bahrain and two unprecedented nights in Abu Dhabi and Dubai. Land options include shopping, sand dune adventures, visits to beaches, museums, souks and a perfumery. Oceania Cruises 1,250-guest Marina, scheduled for delivery in January 2011, successfully completed sea trials on 26 September, which included three days of sailing the Mediterranean for the first time. During the sea trials, technicians and engineers from the Fincantieri shipyard along with Oceania Cruises' marine and technical teams evaluated the vessel's speed, manoeuvrability, hydrodynamics and propulsion, among many other aspects of the ship's performance. Oriana, sister ship to the equally popular Aurora, has set out on its first ever autumn world cruise. The 84-night sell-out trip offers an alternative to the customary New Year departure. Oriana is calling at 28 ports in 19 countries including Acapulco (Mexico), Margarita Island (Venezuela), Kahalui (Hawaii), Phu My (Vietnam), Singapore and Ko Samui (Thailand). P&O have published a study of over 65s finding that many envy the lifestyles of the young, with the majority (57%) saying they wished they had travelled more and 45% wishing they had quit their jobs and changed professions. This latest research reveals a 300% increase in “grey gap-years” since 2005 with the number of pre-retirement gap years now reaching 200,000 annually. These are also being fuelled by redundancies and the 90,000 people who choose to take a career break every year. Paul Gauguin Cruises is offering children free access to its revolutionary Ambassadors of the Environment Youth Programme on two nine-night Society Islands holiday voyages departing 18 and 27 December 2010. This programme is usually available for a fee of US$269 per child. Saga's classic cruise-liners Saga Ruby and Saga Pearl II will be setting sail in opposite directions to mark the start of the 2011 schedule. Departing from Southampton within just a day of each other, both ships will be heading off for exciting adventures across the globe, with Saga Ruby bearing east and Saga Pearl II making her inaugural journey west. Star Clippers, with its three genuine sailing ships, is to concentrate on the Mediterranean for the summer of 2011. The Monaco-based, Swedish-owned operation will make maiden visits to Chios, Kos, Myrina (Lemnos), Sarti (Halkidiki), Skopelos, Skiathos, Skyros, Poros in Greece; Canakkale and Istanbul in Turkey. The Passenger Shipping Association (PSA) has published figures that show that 448,000 passengers visited a UK port in 2009, a 7% increase on the previous year, while the number of passengers joining their cruise ship in the UK increased to 733,000, just under half the total of passages sold. There are cruise ships and there are cruise ships and your Editor is fortunate in having passed passage in many, from big to small, from Queen Mary 2, to the equally wonderful 50-guest Hebridean. And he has river cruised in what are relatively narrow ships with limited facilities (for both passengers and crew), and even on the Thames and the Canal du Midi in the south of France. They all have their good points, and also some aggravations. 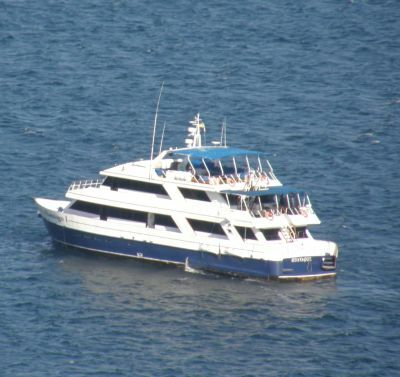 Now added to the list is MV Eric, one of three virtually identical vessels (Letty and Flamingo are the sisters) built about 20 years ago and custom designed specifically for cruising in the Galapagos archipelago. With a top speed of 12 knots (but 8 most of the time), the yachts possess highly sophisticated navigational and mechanical equipment and are equipped with solar panels and wind turbines which supply 70% of the electrical power used on the ship. 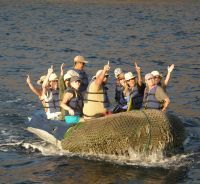 All are operated by Ecoventura, a specialist tourism company based in Miami. Actually on the Equator and brought to the world’s attention by Charles Darwin with his extraordinary “Evolution of the Species” explanation (1855), the Galapagos islands lay 500 miles off the coast of Ecuador. Getting there from Europe is not as difficult as it sounds, yours truly routing Continental London – Houston – Quito (and more anon) and then to Guayaquil, the country’s largest city and major port. From here modern jet services are offered to two islands, San Cristobal and Santa Cruz. There are plenty of alternative flights to both main Ecuadorian cities, mainly from Madrid and Miami. AERBT will be reporting on both Ecuador and the Galapagos at a later date. 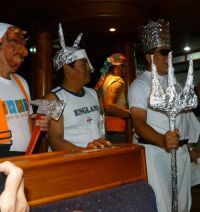 There were nine crew on Eric plus two excellent naturalists, who double up as guides and ship organisers and are also the scuba and snorkelling experts. The working arrangement seems to fit together very happily. The ship is equipped with a pair of Zodiac style craft, used as tenders and lifeboats. Also available are a pair of kayaks. Wet suits (the water can be quite cold) and underwater equipment are supplied. Boarding is via a platform at the stern. Accommodation: Considering the size of the ship (86ft long with a beam of just 24ft) the cabins are surprisingly spacious and well fitted out with rosewood trimmings and plenty of hooks and storage space. Toiletries and fresh towels are provided. There are just ten cabins located on three decks with mostly single beds although some down by the waterline have a bunk. The two mid-deck offerings, at the stern and on the same level as the ship’s restaurant and social area, have double beds, but only single access. This can be “interesting” in the middle of the night. Courtesy bottled water is supplied throughout the ship. However being in a fragile ecological area guests are asked to refill from a large container in the social area, rather than open a new bottle. Perhaps some other cruise lines, who charge excessively for water bottles and make it difficult for guests to refill, could emulate. 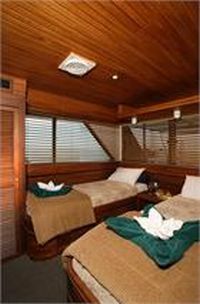 All cabins have a largish private area with a freshwater hot and cold shower, toiletries, hair drier, electric points and fresh towels. Somewhat basic and antiquated air conditioning is provided but it never got really that hot, even when off-ship on the islands. Dining: Perhaps this is the one element that lets the ship down. Whilst passengers are on board for the Galapagos tour, not a cruise experience, the holiday is not cheap and with a little effort the dining could be improved substantially. In terms of volume you will not go hungry but at breakfast for instance the cook could easily provide for an individual egg station. A vegetarian offering was always offered and usually a soup course, and it was generally a choice of chicken or beef, or both. Lunch was self-service and in the evening the sole waiter (who doubled as the bar attendant) served at the fixed (in that they were fixed to the floor) tables. Clients could sit where they liked and a nice touch was the Captain’s table (ex-Ecuadorian Navy) where all the guests were invited in rotation and wine provided. Soft drinks came courtesy of Ecoventura, as well as a welcome and departure cocktail. Nuts and savouries were always available and with just 20 guests maximum a private house atmosphere was always retained. English is the public language of the ship (Spanish the working). Entertainment: This is neither provided or required. Every evening the naturalists give a talk on the background to the next day’s activities and detail the programme. It is normally half a day water sports (or resting) with the balance visiting an island or two. A couple of large flat screen TVs support the talks, and these are also useful in viewing the large DVD library. Naturally of course “crossing the line” is celebrated in traditional style. On this particular trip not a single soul smoked (nor much in Ecuador generally with its ‘eco’ philosophy the country for the most part is ‘non-smoking’). The whole cruise was an early to bed and early to rise affair, our travelling companions ranging from a Hollywood publisher to a Canadian university Don. Everyone got on very well. On the last night one of the naturalists provided a fine DVD slide show of the whole trip, and then offered courtesy copies to everyone, a nice touch. On Board Services: There is an inter-cabin communication system and a small library. No medical staff is provided, the Captain doubling up as a Navy style nurse, the Naturalists also trained in this area. Your cabin is attended to by a steward but for most things it is a question of self-service although assistance was at hand when a guest needed to dine privately due to tummy troubles. You are cut off from the world with only the ship’s company radio available most of the time. No TV (we did not even know that the Chilean miners had come to the surface) and both internet and phone facilities are very limited. The Galapagos is not cell phone friendly except close by the four inhabited islands. What Else: Unlike some of even the largest passenger ships you can stroll right around the ship on what could just about be called the promenade deck. For those who wish to return home even more brown the large sun deck is ideal. 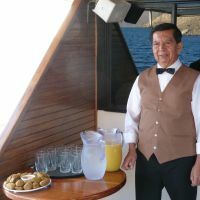 The bridge is always open for visitors and clients are allowed to steer the vessel, under supervision. The engine room is open too. And Peter the Captain is happy to have a chat. Like virtually all the crew he has been with the company many years. From time to time Dolphins accompany the ship, and Whales can be seen too. In Conclusion: Only 85 ships are licensed to operate fare paying passenger services in the Galapagos. Many of these are very small private yachts (indeed some with sails). There are several ships in the 75/100 category but don’t expect big cruise liner hospitality and facilities. In fact the guide to passenger ratio is nearer 16:1 rather than the 10:1 on Eric. The seas around the Galapagos for the most part look calm. This is misleading. The mostly squat ships used around the islands can find the weather demanding depending on the wind direction. No big waves but bumpy, for the most part during night crossings. Just be prepared.